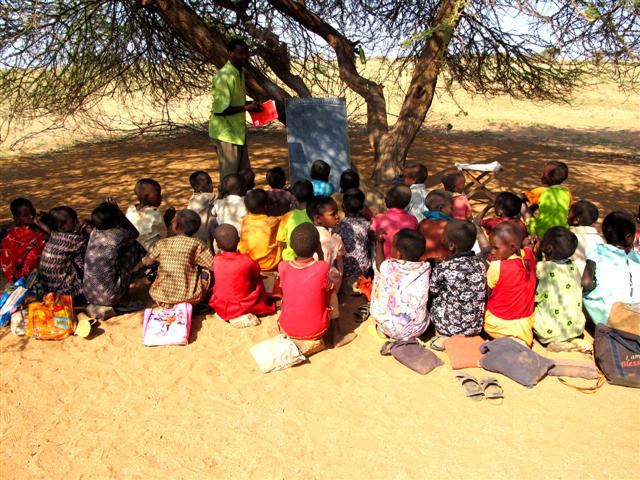 Tirrim Nomadic Primary School serves the young children of the semi-nomadic Rendille tribe in Northern Kenya. The harsh conditions and remoteness of the area has resulted in being cut off in many ways from the developed world. They do, however, have a desire for their children to receive an education even though very few facilities are available. On the first day of the school year, after the first permanent classrooms were completed with funds from Classrooms for Africa, over 1000 students showed up to register for 60 places! Building in this remote area has many challenges because all building supplies have to be trucked in from Nairobi, which is a many days journey away. Construction materials have to be steel and concrete as the inclement climate makes it impossible to use wood of any kind. The school is sponsored through the Africa Inland Mission and the Africa Inland Church.